As an expression of LADOIRE's horological grammar, the Roller Guardian Time Punk White immediately invites attention. Introducing an unforeseen style, this timepiece combines technical supremacy with a side-glance at Punk Rock aesthetic codes. Clad in white, this striking model anticipates future trends and adorns time with a magically Haute Couture dimension. By integrating a three-dimensional vision during the entire creative process, LADOIRE meets the highest standards in the art of watchmaking and formulates a bold and holistic style statement. As a promise of ultimate refinement, the Roller Guardian Time Punk White heralds this distinctive horological approach where extraordinary readability and avant-garde design converge to form an intricate bond. Crafted in titanium, with its startling lively hues, the case’s curved and stretched lines reveals the strength of an accomplished architectural edifice that underpins a powerful personality. Sumptuous and unique, its geometrical proportions express a swift sensation of velocity that is boosted by a dynamic and agile interpretation of an engraved ornamental “Clous de Paris” pattern. This ingenious mastery is visible in the subtle interplay between various shades that enhance to perfection its meandering curve. Capturing all the essence of LADOIRE’s watchmaking philosophy, the indication of time takes on an innovative look. Directly inspired by cutting-edge technologies, three rotating disks mounted on high-tech ceramic micro ball bearings reveal this pioneering character. Fascination reaches a peak with the visual representation of the overlapping elements of time that organize the measurement of the seconds, the minutes and the hours of life. Offering a view on the sophisticated workings of the openwork movement, the dial is composed of a black and white parade of bridges and plates that create a contrasting whole underscored by the enchanting perspective of their complex arrangement. 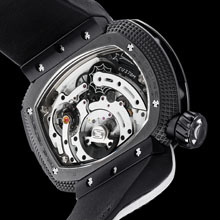 The open caseback beckons the eye to discover watchmaking excellence manufactured by LADOIRE: The Calvet/01/RGT calibre. 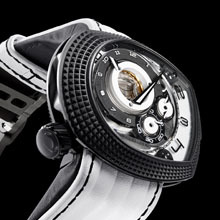 Housing a micro rotor, this self-winding mechanical movement beats to the rhythm of 18,000 vibrations per hour. Water-resistant to 50 meters, the Roller Guardian Time Punk White is a strictly limited edition of three pieces; each fitted with a full-grain stunning white leather strap featuring a highly adjustable double ardillon buckle entirely created and developed by LADOIRE. With its matchless and playful measurement of time, the Roller Guardian Time Punk White propels LADOIRE to the pinnacle of the elite world of Swiss Haute Horlogerie. • Calibre with automatic winding-mechanism, manufactured «Calvet/01/RGT» 26 jewels, on plate: 9h 3h > 39.50mm / 12h 6h > 29.50mm, thickness 9.30mm.